I am seeing rainbows everywhere. I love seeing a rainbow appear in the sky so imagine my joy today where I've been at Urban Saints all evening, staying for all of our Monday night youth groups where we've covered the story of Noah and co. not once, not twice but three times with varying age groups. In the space of a few hours we've created a big colourful ark poster full of animals (above), made bracelets of rainbow coloured bracelets, made rainbow badges, decorated cakes forming a rainbow from skittles and acted out the story with an array of children in pairs doing animal impressions, amongst many other colourful activities. I loved reading the story to the youngest children (I love reading aloud) and then was granted the privilege of being the wife of Ham (Noah's son) in the drama. All good fun. You really haven't lived until you've built an ark out of chairs and stood with your church friends inside it wearing a waterproof jacket to represent Noah and co. for the educational entertainment of small children. I feel like I should be a Noah expert,but I've still got lots of arktastic questions hanging about on the tip of my tongue for another day. If you think about it long enough, you realise that when God asked Noah to build the ark, he probably wasn’t that cool with it straight away. If God asked me out of the blue to make an ark and then find a pair of every animal out there, I'd be like 'sorry...whaaaaaatttt!?'. It's a strange request, so I bet Noah was pretty baffled. Still, he went and did it- taking some serious faith i think! 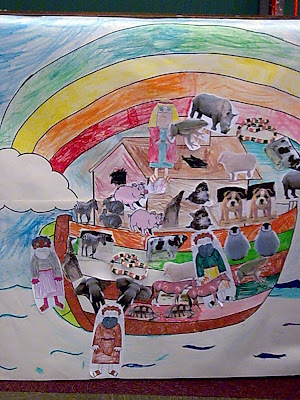 It was really refreshing to hear the response of one of our children today when Deb asked the group of primary school children what they would do if God randomly and unmistakably asked me to build him an ark. I had to admit, alongside other leaders, that I'd be thinking twice about the whole situation, but she was on the ball. She answered immediately, as if the most obvious response in the world, 'Well I'd go and build it'. What a simple response, and yet wise words from a seven year old who often teaches me! Perhaps this is what Jesus meant by becoming more like a little child! If I didn't love seeing the rainbow so much I'd say it has been Noah overkill this afternoon, what with hearing the story three times, acting in it, singing about it, cutting out animals..etc. but I doubt the rainbow will bore me, I just love the colours. And this is before I even begin to think about what it stands for. A sign of God's promise- the passing of his judgement, His awesome love and faithfulness always! It has been another lovely day, beginning with the visit of Mawbs and Sian before we headed to college to see the photos Helen Brown (assistant principal) has from the prom and results day. We caught up with Fran, our old english teacher and I popped in briefly to see Aimee my singing teacher which was lovely. Mawbs went off to work at one, and Amy joined Sian and I for lunch at mine, consisting of beans on toast, followed by a 'Banana surprise' - my improvised dessert created from angel delight (banana flavoured), bananas and kit kat (both grated and intact.). Effort went into this I can assure you, presentation in Brandy glasses was key to the surprise. After casual viewing of Loose women and Airport which were more background noise to our somehow quite in depth discussion on how to put the world to rights, Bo came to collect me and we visited the co-op to buy dinner before heading up to Quest for the arktastic evening of Noahness. It has been kind of sad this evening, today being my last Monday in Leicester and therefore my last Quest and Rock Solid sessions for a while. I’ll miss regular moments like today when we had to spring spontaneously into action to act dance and sing the parts of Noah, Moses, David, Daniel and Jesus- again for the entertainment and education of those younger than ourselves. I will miss ‘Chris/Tom (nominal male)...can you be Jesus again please..?’, and having dinner with my church family as today was my last until Christmas! I, the girl who never cries at much, even found a few tears welling up when saying goodbye to big sister Pat this evening! It is the end of an era, without sounding too cheesy, but I know that on my departure I’ll never be short of love or prayer from back home, and judging by the example of my elders such as Chris, Tom, Ruth, Becca and the rest of the gang, I will most definitely be back in a big way at Christmas for church Chinese and a whole lot of Christmas services! This year I have really come to appreciate that my church friends, really are my family. As cheesy as it might sound to say 'Brothers and Sisters' the truth is that as christians, we believe we are part of God's family, his children. And because we are all Children of God because our relationship with him is restored through the death of his son Jesus, my friends who are christians, truly are my brothers and sisters! And i love them! photo taken on the 7th september concluding our weekend on the barge!